A true fitness fiend will just go to the nearest park for a jog, or at least hit a practical gym. He wouldn’t be particularly kicked by the idea of working out in a high-end fitness centre or sweating out in a home gym as such indulgence would represent style rather than substance. Right? Wrong. Home gyms are gaining popularity. 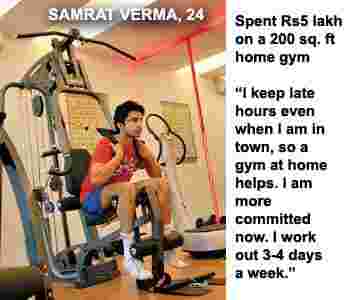 Samrat Verma, 24, who assists his father in their garment export business, recently converted his study into a gym. “It saves commuting time, is convenient and offers privacy," he says. Just what most of us are looking for. Before investing your time and energy in designing a layout, consider your fitness needs, the available space and then allocate a budget. Inclement weather will no longer be able to dampen your gymming spirit. A premium brand multigym costs upwards of Rs2 lakh. Setting up a gym with basic entertainment and ventilation system, lighting, flooring and wall paint would cost around Rs50,000. This, along with the cost of equipment, could mean an expenditure of Rs1-1.5 lakh. The minimum area needed for a home gym is around 150 sq. ft. Do remember that you also need some space to move about. Verma divided the 200 sq. ft available into two parts to include a jacuzzi. The bigger area has three main workout machines—a treadmill, a multigym and a power plate machine. He also has handheld free weights, which occupy very little space. Besides the main machines, you can also equip your gym with space-efficient options such as dumb-bells (around Rs85 for 1kg), resistance bands (Rs700-800 each) or an aerobic box (around Rs1,500). “A floor mat can also be added," suggests Shibu. Avoid setting up a gym in the basement. “These are poorly lit and ill-ventilated. Light and air is very important for a gym," says Aanchal Nath Gulati, a Delhi-based interior designer. A good floor plan is important so that the space is utilized in the best possible manner. Keep larger equipment against the walls and the smaller or loose ones in the centre. This will allow good circulation of air, maximize space and improve the appearance. Delhi-based architect Ravi Kaimal suggests installing rubber or vinyl flooring. Rubber flooring doesn’t restrict exercise movement and is comfortable for standing, running or walking on, unlike on a carpet or a tiled floor. “Rubber flooring also helps cushion any falls," adds Kaimal. It protects the floor surface from the pressure of cardio machines. Depending on the brand and the quality, rubber flooring can cost upwards of Rs100 per sq. ft. Vinyl flooring (Rs50-150 per sq. ft) cuts down noise, is antibacterial, stain-resistant and easy to install and clean. Artificial lighting should be bright without flooding the vision. If you do a lot of floor exercises, have lights concealed within ceiling coves. “Or have light fixtures that are shielded with frosted glass," suggests Gulati. These will give out softer light, which will not hurt the eyes while looking up at the ceiling. Lights that can be dimmed are also a good idea if a right atmosphere is required for doing yoga or for cooling down after a workout. “The right lighting creates a bright, cheerful mood, motivating enhanced physical activity," says architect Nilanjan Bhowal, who designed Verma’s room—it has lights concealed behind mirrors affixed on a brightly-coloured wall. Mirrors, music system, TV, DVD player, jacuzzi—these are the accessories that will make your workout more enjoyable. Make sure the wiring is properly laid out so that electrical equipment can be added later without the fixtures looking tacky. Mirrors are essential as they help you check your posture while exercising. An air conditioner and an exhaust fan are also necessary as your body will generate heat and sweat. Install a TV at eye level so that the neck is not strained while watching it. The gym should smell nice, says Kaimal. “It promotes a sense of well-being," he says. A bold colour on the wall will keep you feeling energized and add interest to the room.